With Easter now fast upon us, I would like to take this opportunity to explain just very briefly why I think you should attend the Easter Vigil. The Mass for the Easter Vigil on Holy Saturday night is the liturgy of all liturgies. All of the symbolism that makes the typical liturgy so rich and meaningful is multiplied by 100 for the Easter Vigil. What this means is that you’re going to see and experience something truly unique. For one, the Mass begins with the lights out. The only illumination comes from a massive bonfire burning outside. Once the Paschal candle is lit by the fire, its flame is used to light small candles held by those in the congregation. To see the church ultimately alive not by the force of electricity but by a holy fire is truly a sight to behold. The Liturgy of the Word during the Vigil Mass is also much more substantial. It is essentially a grand tour through salvation history, as reader after reader tells the story of God’s interventions into human history. It is awe-inspiring to see the plan of God unfolding and to reconsider the often arduous path that lead to the moment when God finally gave us His Son and raised Him from the dead for our salvation. Thirdly, the Vigil happens much later in the evening then we are used to celebrating Mass. This may be off-putting at first, but the late hour is instructive and meaningful for us. The dark sky reminds us that we live in darkness without the light of Christ in our lives. It also reminds us that those who celebrate the Vigil are in waiting, are truly taking vigil, anticipating the moment when our Savior will rise from the dead and share His new life with us. Reason #2: Welcome to the party! 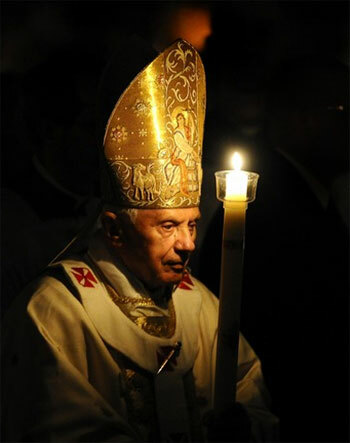 Since the revival of the RCIA process after the Second Vatican Council, the Easter Vigil has taken on new significance as the liturgy that welcomes new members into the Church. This year we have one catechumen who will be baptized and three candidates who will receive with her the sacraments of Confirmation and Holy Communion. This is cause for great celebration! These four people each bring their own gifts, and talents, and aspirations to the Church, for the benefit of all Her members. This can only work to build up and renew us here at Blessed Mother. But, beyond the benefit for us, we should also celebrate this occasion for the simple fact that four more souls are entering into the fullness of grace and truth. Praise God! Considering all this, what message would it send if the church was only half full, or if no one attended the reception afterwards? We should show these new Catholics that we are thankful for their presence and for the hard work that brought them here. I hope that you will come to welcome them and to experience the awesome beauty that only the Easter Vigil can bring. Christ is coming soon. Are you ready?